1. 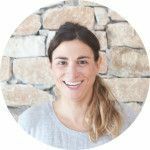 What do you do for a living, how did you become a digital nomad / remote professional and where you are based now? Since 2006 I work as an SEO and I am specialized in online marketing. I left my last job in agency in 2010 with the goal of becoming a freelance and I started to work from my home, in Madrid. In the summer of 2012 I decided to leave Madrid for 2 and a half months to travel around the north of Spain staying with friends friends who lived along the beach. They didn’t have Internet but I could do my work using my phone as a router and some days from Internet cafes. Every 3 weeks I went back to my parents house to work hard and use their Internet connection. Just now, I´m doing the interview from here (you can see the picture) and I´m waiting for improve the sea´s conditions and could gone to the water before sunset. Until the beginning of this year, 2015 I have been working with another person, but currently I’m working alone. There were two of us and both of us worked remotely from different places, 900 km away from each otherI worked from Santander or Madrid and he worked from Benidorm. 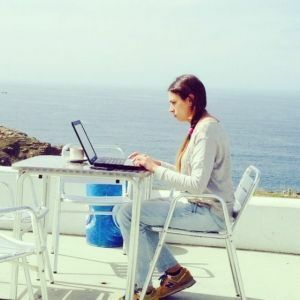 Since I began to work by myself, I realized that it was my dream to be able to work from anywhere.I love surfing and when I started surfing I tried to come to the north of Spain from Madrid, two or three times per month. This hobby, probably, was the most important factor to love my condition of remoter. And in fact, I have now been living close to the sea for almost two years. This is possible only because I am a “remoter”. 5. How do you keep connected with the team? Do you meet somewhere frequently? If this is the case, where and how often? You can find me connected on Skype every day. The remoters.net team are working with Slack and it´s amazing for us. We meet sometimes in Madrid, and I use that time to also meet up with my clients whose headquarters are in the capitol. The periodicity of the meetings has been very different throughout these years. Some years we met only 3 times and other times we have seen each other 3 times per month. I have no doubt that the main advantage is the mobility. The fact that I don’t have to stay in a specific place is a luxury. Anyway, each person enjoys different situations. For me, this kind of life allows me to travel to see my parents often, to spend where I choose and finally to live where I had always desired to be. I can live on the waterfront instead of in a big city. The biggest challenges are solving the problems through skype and the phone. I think that it is very necessary to have more confidence in your team than when you work in an office, where you can see everyone face to face. There have also been some customers that have needed to have physical and face to face meetings, but usually only at the beginning of our contracts. I overcome these challenges with professionalism, as I already mentioned, some customers preferred to see us quite often in the beginning, and after some months they saw that it was not necessary because the work and the objectives were carried out successfully although we hadn’t presented the results in person. Yes, you lose the social relationships and companionship which you can find in an office. But I find balance with people who do not share the work with me. I work sometimes from a coworking and these places help me find people to share work related moments with. Yes, I commented that some clients needed to meet me physically, especially at the beginning of the relationship. However there are many clients who don’t ask where you live and don’t require that kind of face to face relationship. My work philosophy aims to find a balance between my work, my hobbies and the liabilities. The most important factor in my work environment is to feel comfortable where I am working and I would like to collaborate with other professionals that look for the same things and who do not give importance to where you work. Mainly I have worked in Spain, except for some trips I have taken, in which I have been able to combine holidays or a professional conference, and work, a sort of “workation”. 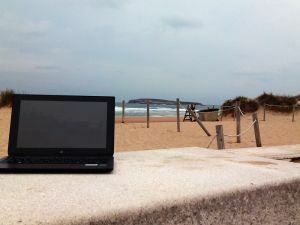 I do not have a sole favorite place, but I can tell you some of my favorite places… these are the places where I can work from my van or close to it. I love waking up in my van, going into the water and surfing and then starting my day. king spaces? Coffee shops? Somewhere else? Why and which are your favorite ones? Not especially, I adapt pretty well. I only I need a table to work comfortably, it´s the most important thing for productivity. 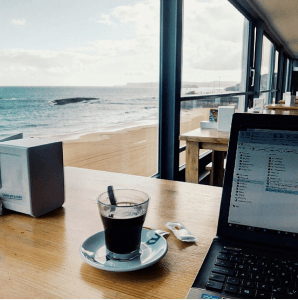 I have two kind of typical working days: When I am at home, at my home base (in Santander), I usually wake up at 8 am, have breakfast and go to the coworking where I work until 15. I come back home, have lunch and continue working until 18 or later. Afterwards, I try to do some sports or meet up with friends. In the summer, I try to not work in the afternoons and I try to start to work early. I would not change it for anything. I give my life a 10 just now. I get to balance my life and my work at maximum. Like in every job, there are periods with a lot of work, at those times, being a remoter is negative because you can´t separate the hours and I am thinking about work all the time, but I try hard for that not happens. 15. How being a digital nomad has changed you? Specially, I notice it in the rhythm of life and the way of seeing it. I´m calmer and I am much happier with my work. I go to the coworking when I need to focus, but if I am concentrated I can work from anywhere without distractions. Some tricks are, when I am at home, to do the home works to taking advantage of breaks and not merge work with obligations. When I am away from home I deactivate the notifications to avoid distractions. I would tell them, that they should try it because a lot of people have less distractions in their homes than in the offices. Working at home you can´t go to take a coffee, nobody comes to your computer to show you something, etc. I think that at home you can work much more than in an office. My essential tools for communication are: Skype, Hangout and Slack. For the project manager: Trello (for tasks) and Paymo (to count hours). And for the documentation management: Dropbox and Drive are vital. Any beach could be a good place. 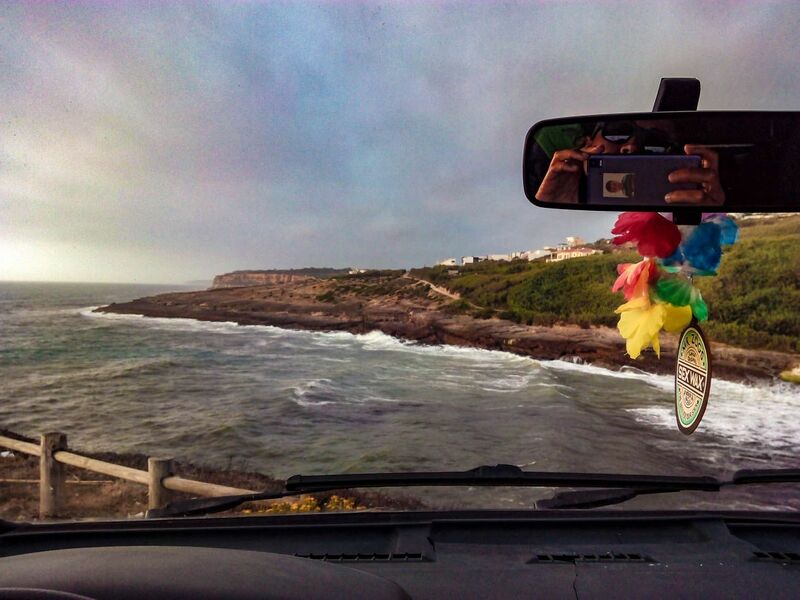 I have yet to make a tour around Cantrabrico Sea and Portugal with my van, my board and my computer. Working, surfing and taking pictures on the road. Maybe I could do part of it this summer. I am also dying to work from Asia and South America. The best of working remotely is the sensation of freedom that you can feel. The worst things are the moments when you need to share or to ask some things to other people and you are forced to solve them by mail or skype. And the other thing is the difficulty to take some holidays. It´s very easy to take some days off, but it is almost impossible to take a week, or two weeks at a time. At the end the solution is to have “workation”, but it´s not enough many times. 21. What advice would you share with people looking to start working remotely? Well, I don’t know if my advice could be useful to anyone, but I will try to give you things that have worked for me. You need to be very organized and you need to manage the lack of routine to try to improve your productivity. It is also important to be happy from the beginning to see the advantages of this kind of life and become a real, good and productive remoter. If you think that I could help you somehow or you have more questions, you can tell me and I will be happy to answer you.